Search for the best flight prices from Stansted to Bodrum. Compare prices, book today and save money with Stansted Airport. For years Bodrum has been hailed as the Turkish seaside town of choice for authentic Turkish style. This lively harbour town not only offers a selection of unmistakably stylish clubs and hotels worthy of the finest European cities, it also manages to retain an authentic atmosphere born from the hectic market stalls, exotic Turkish culture and fresh seaside air. This village of whitewashed cottages draped in vines and tinged with fresh seaside air scores highly on the holiday card with everyone. Up on the hillside, the Manastir Hotel (Mustafa Kemal Caddesi 37) offers chic seclusion for luxury lovers. Asmin Hotel (Alibaba Sokak 9) offers mid-range accommodation seekers a central, comfortable choice with rooms right beside the castle. Or if you want to be near the beach, Gulet Hotel (Cumhuriyet Caddesi 177) has clean, spacious rooms. Budget travellers are in for a treat in Bodrum as well because Melis Pansiyon (Turkkuyusu Caddesi 42) is one of the friendliest places in town. Some of Bodrum’s best shopping is to be found in the marina area. Boutiques line the main road (Neyzen Tevfik Caddesi), offering local jewellery, ceramics and carpets in addition to fashionable beachwear. Check out the narrow streets behind the castle for more craft shops, while the market is located next to the bus station and highly popular with locals. Head there on a Tuesday for the textiles, and Fridays for the local produce. For a superb offering of Turkish favourites head to Orfoz (Cumhuriyet Caddesi 177), while if its seafood that gets your tastebuds tingling then you'll be thrilled at the bustling Fish Market (Cevat Sakir Caddesi), where the catch of the day couldn't come fresher. Nazik Ana (Hukumet Sokak 7) is great for rustic local food at cheap prices, perhaps before you hit the plentiful bars in town. The young and beautiful flock to Küba (Neyzen Tevfik Caddesi 62), or for something a little more low key head to Mavi Bar (Cumhuriyet Caddesi 175). Enjoy the treasures of the underwater world at this festival in May. The Bodrum Underwater Society help put on exhibitions through the day and then music in the evenings, with rock bands and DJs taking centre stage. The marina’s yacht club hosts this free festival celebrating both established and rising jazz musicians as the sun sinks into the ocean. This mass bicycle ride is a great event for families, and the festival features plenty of carnival action along with music and dance performances once you're all pedalled out. 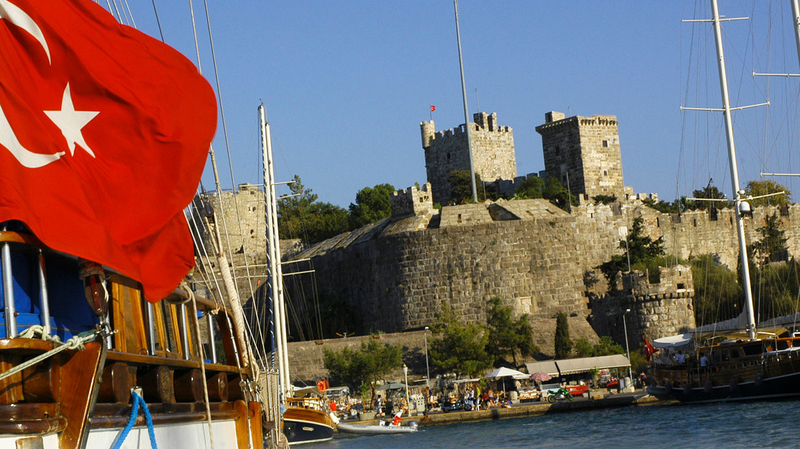 Turkey's national opera and ballet companies convene in the enchanting setting of Bodrum Castle and entertain the crowds with a series of performances. The Bodrum Cup marks the end of the yachting season, and sees a regatta featuring Turkey's traditional wooden yacht, the gulet. Once evening draws in the parties and live music all kick off at the marina.